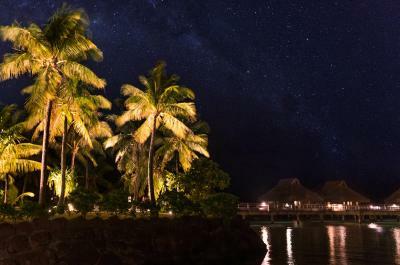 Lock in a great price for Conrad Bora Bora Nui – rated 9.4 by recent guests! The service was perfect and the staff was so nice and welcoming. We loved our welcome tour with Melissa. The food was good. The facilities and spa where awesome. 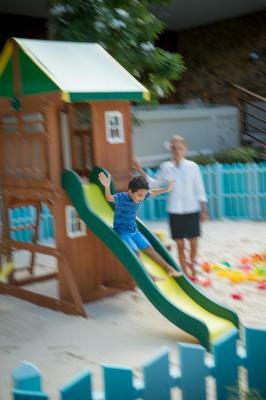 We loved snorkeling around our over the water villa, paddeling and swimming at the pool. The staff was very friendly. Food was awesome. Stayed in overwater villa and the view was amazing. Exceptional staff. Beautiful/very well designed room with a great view. 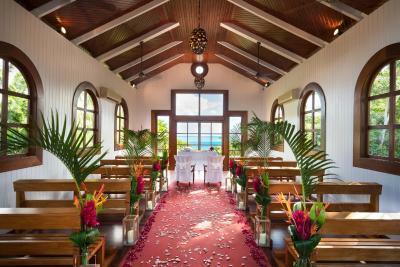 This property was private from the other resorts on the island, which made it the perfect secluded getaway. The staff...wow...beyond exceptional! 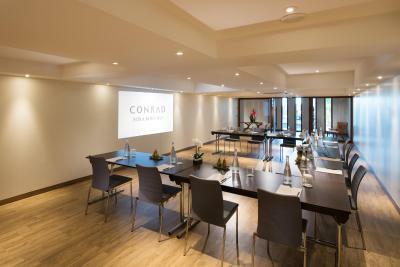 Each and every one of the Conrad team were kind, gracious and helpful. When available, the staff were very friendly and helpful. The bungalows were amazing; newly remodeled. 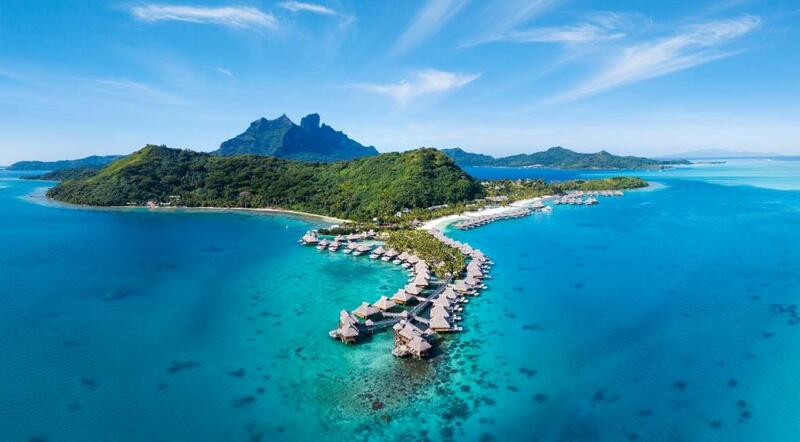 I had the opportunity to see the outside of the other over water bungalows at the Pearl, Intercontinental and the Meridien and the Conrad's were by far the best. Location was perfect. Great snorkeling right off of our bungalow. We could also see the sun set. 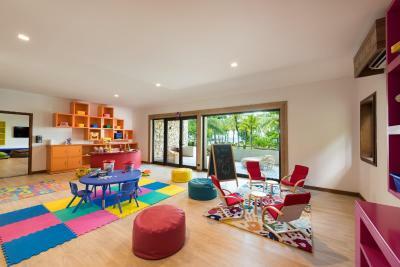 Bungalow was new, spacious and clean. Plenty of room for all 3 of us. 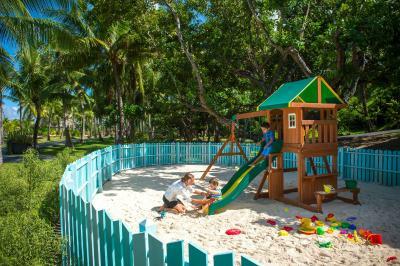 Conrad Bora Bora Nui This rating is a reflection of how the property compares to the industry standard when it comes to price, facilities and services available. It's based on a self-evaluation by the property. Use this rating to help choose your stay! 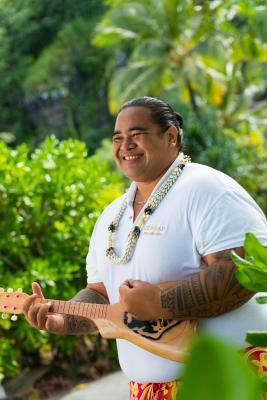 Exclusively located in a private cove on Motu To’opua, Conrad Bora Bora Nui enjoys vast blue ocean views and a white sand beach. 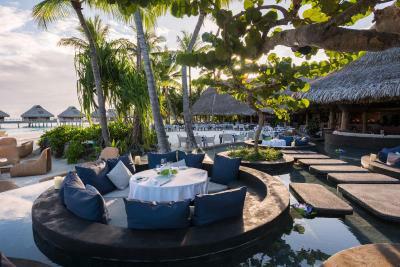 The property features luxurious villas floating on the turquoise waters of the lagoon and perched on the tropical hillside. 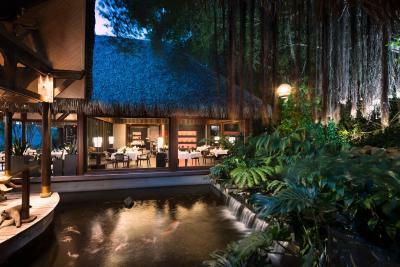 Guests can enjoy a swim in the infinity pool, feel pampered with a treatment at the day spa or sample fine cuisine at 4 restaurants. 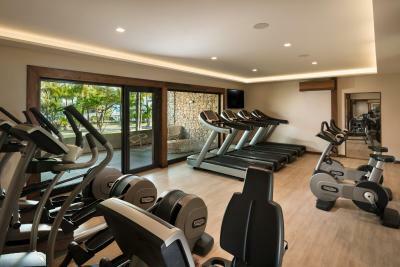 The resort offers 3 bars, a kids club, a hilltop spa and fitness center. Free WiFi is available throughout the property. 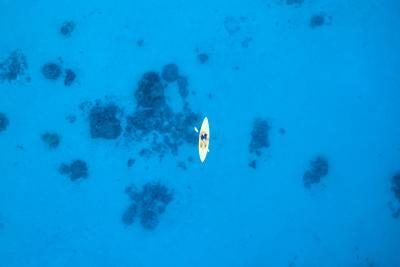 Conrad Bora Bora Nui is approximately a 20-minute boat ride from Bora Bora Airport. 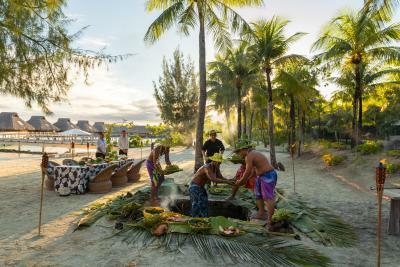 When would you like to stay at Conrad Bora Bora Nui? 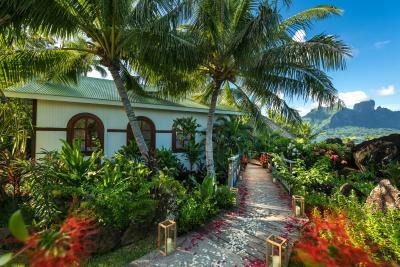 Savor the lagoon views as you dwell in this Polynesian décor inspired villa with a king canopy bed and separate seating area. 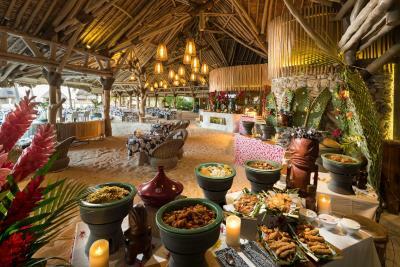 Peacefully tucked away at the lush coconut garden, the villa offers peace and relaxation. Soak in the stunning panoramic views from the private terrace of this stylish villa, located on the hillside overlooking the lagoon. Relax on the king canopy bed or in the separate seating area. 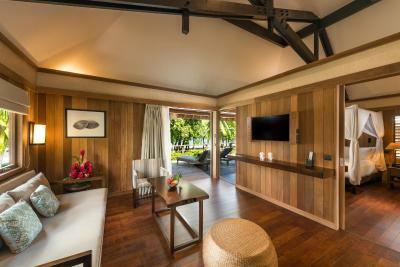 Relax on the king bed of this spacious suite and soak in the stunning views of the lagoon from the private terrace. 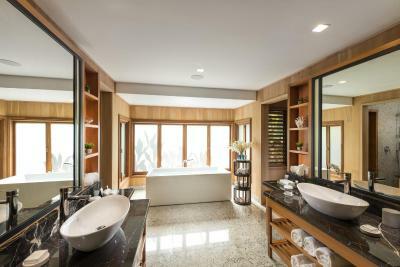 It offers a stylish bathroom and a separate seating area featuring understated Polynesian-inspired décor. 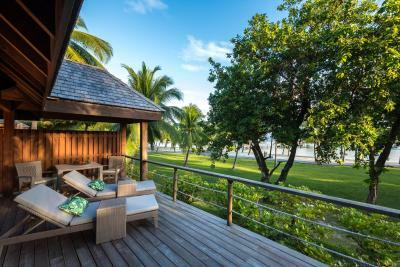 Soak in stunning views of the island and lagoon from the private waterside balcony of this overwater villa. 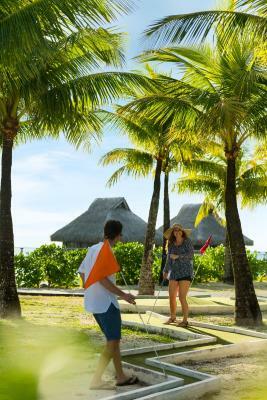 Discover the marine life below by relaxing on the outdoor catamaran nets suspended directly over the water. The suite features a king bed and separate seating area. 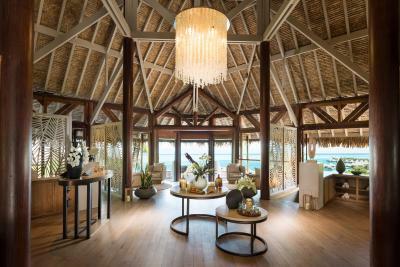 This overwater villa offers completely unrestricted views of the lagoon from the catamaran nets on the private waterside balcony. 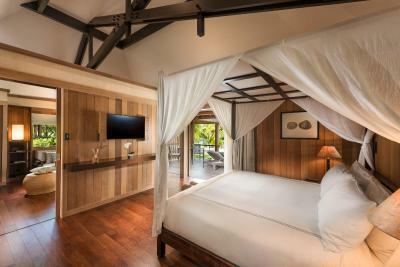 The stylish villa features a king bed and separate seating area, all featuring understated Polynesian-inspired décor. 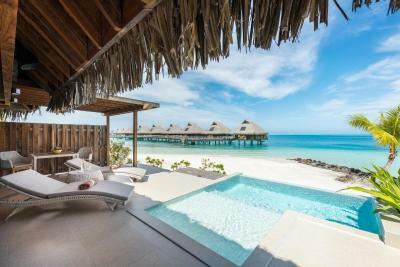 Relax in the private infinity plunge pool on the deck of this spacious overwater villa, which features direct access to the lagoon and an incredible sunset view from the deck. 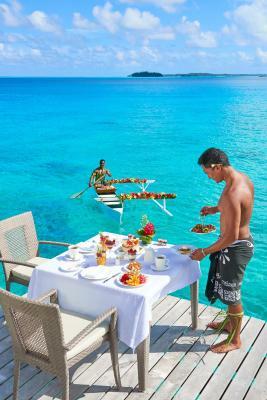 Discover the marine life below by lounging on the catamaran-like nets suspended directly over the water. This triple room has a balcony, private entrance and patio. 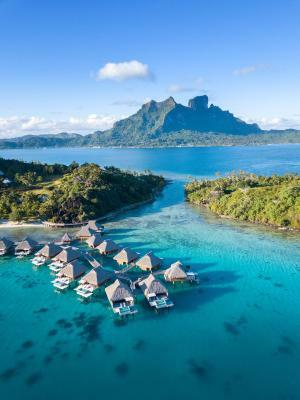 Conrad Bora Bora Nui is located in a private cove on Motu To’opua, a small islet floating between Bora Bora's mainland and coral reef, the resort faces out toward the open ocean. 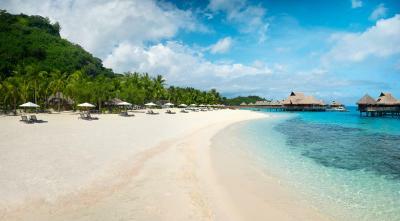 Its secluded beach is the longest white sand beach in Bora Bora. 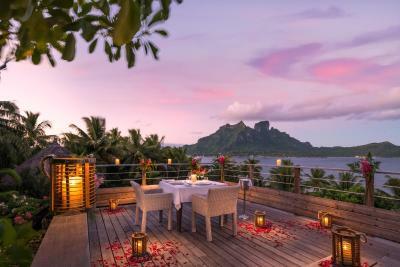 Soaring Mount Otemanu becomes the backdrop to the hotel when approached from the water, while the rooms and bungalows look out upon the lagoon and an endless blue horizon, with the only sunset views in Bora Bora. 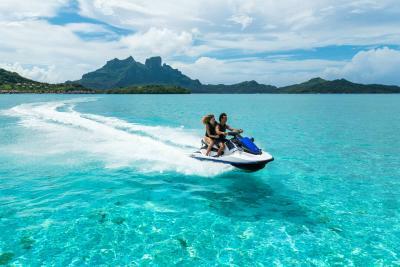 The resort is approximately a 20-minute boat ride from Bora Bora Airport. 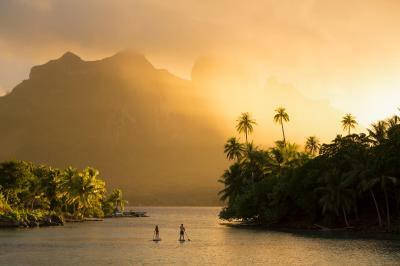 The island of Bora Bora is about 149 miles northwest of Tahiti, approximately a 45-minute flight. 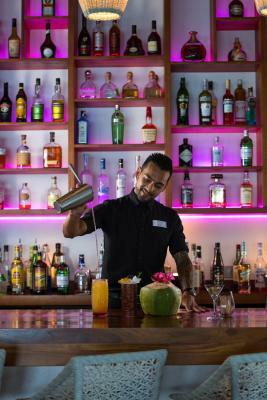 House Rules Conrad Bora Bora Nui takes special requests – add in the next step! 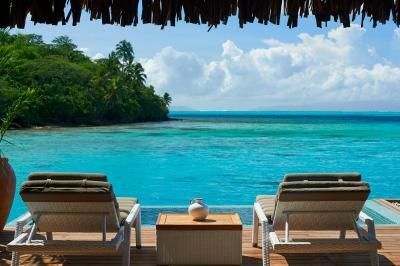 Conrad Bora Bora Nui accepts these cards and reserves the right to temporarily hold an amount prior to arrival. 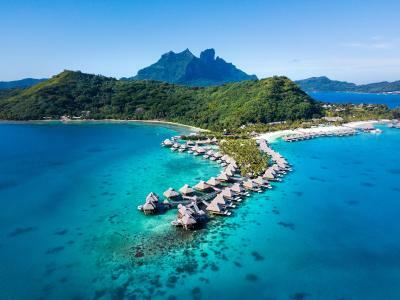 Please note that Bora Bora Domestic Airport is located on an islet. 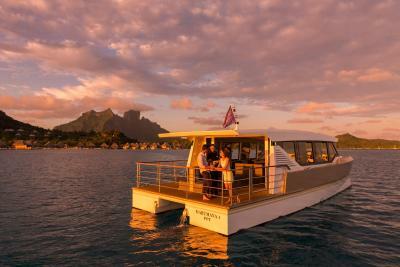 Conrad Bora Bora Nui is only accessible via boat. Please contact the property prior to your arrival to organize your round trip airport boat transfers for the cost of XPF 13,900 per person. Please also advise your flight number and estimated time of arrival. You can contact the property using the contact details found on the booking confirmation. 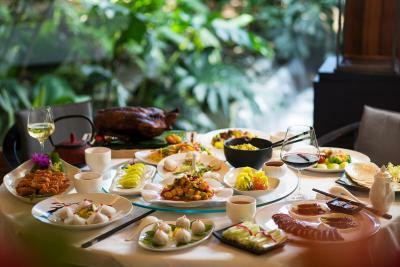 Please be informed that on Christmas Eve and New Year’s Eve, the resort has a mandatory special festive dinner at an additional charge, taking place in one of the restaurants. (All other restaurants, bar and room service will not be available on these evenings). For more information, please contact the property using the contact details found on the booking form. 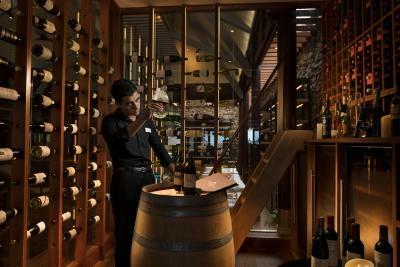 The food and drinks where quite expensive. You have to pay for the transfer to and from the airport. Expensive with the NZ dollar but we knew this would be the case when we chose it and absolutely worth it for the experience. 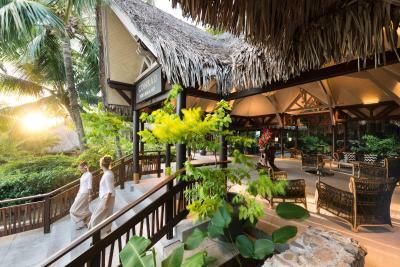 In terms of the resort and the staff there is nothing to fault. The Conrad was truly magical. We cant put into words how beautiful it was and how special our stay was. We were lucky enough to choose here for our honeymoon and it couldn't have been more perfect. 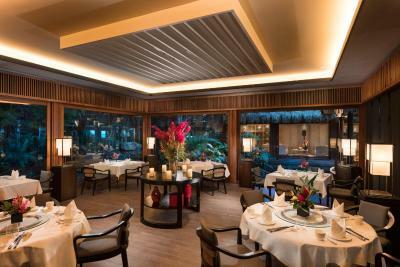 The staff were fantastic and the service was outstanding. 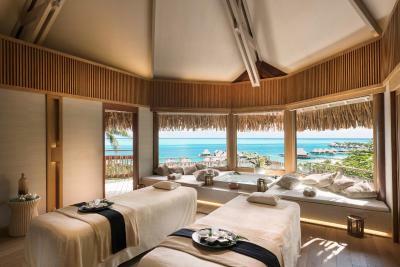 For an extra treat the spa options are wonderful and the location is insane with views of the resort and incredible scenery. 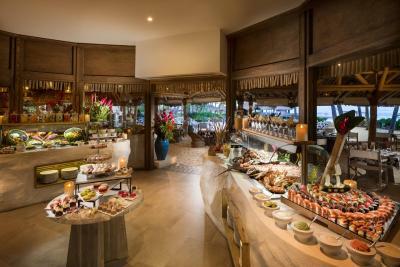 Located in a little unique corner of paradise, The Conrad has exceeded our expectations. Bora Bora is certainly a magnificent place, but the Conrad is absolutely stunning. The attentions to every small part of our honeymoon made it very special. Since the time we landed at the airport, the staff has been absolutely first class. We were impressed they were able to remember our names after one time they saw us!!! The welcoming was scenic like in a movie! The overwater villa with a lagoon view where we stayed was an enchanted private place. Very clean and the attention to the details was first class. Food was pricey but absolutely delicious! 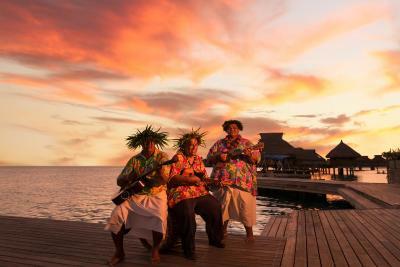 The staff and the location with breathtaking sunrises and sunsets is what makes it unique. E estone is very courteous and genuinely kind. A must stay in everyone’s life! The view from the beach and swimming pool is a bit blocked by the water villas. Super nice hotel, with a nice beach and swimming pool to swim. Very friendly staff. We enjoyed our stay. 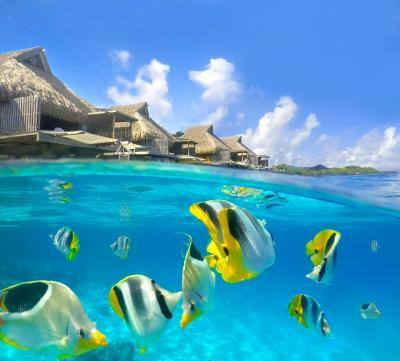 The full-day snorkeling trip offered by lagoon service was really worth it. We swam with the sharks in the open sea (we will never forget this experience) and had lunch in a small private island. It wasn’t a good stay for my husband and me, because everything took a long time in this hotel. For example, when we checked in, we had to wait for our luggage to get for a long time. When we went to the French restaurant, my dessert didn’t come even 30 minutes after I finished my main dishes. Everything was like this. The cloud spft bed!!! The view! An absolutely beautiful resort, we loved our stay.